Karin Musier-Forsyth received her B. S. degree from Eckerd College (St. Petersburg, FL) in 1984 and her Ph.D. in 1989 from Cornell University, working with Gordon Hammes. She was an American Cancer Society Postdoctoral Fellow at M.I.T. with Paul Schimmel from 1989-92. She joined the faculty of the University of Minnesota as an Assistant Professor in 1992 and was promoted to the rank of Associate Professor in 1998 and Full Professor in 2003. At Minnesota she was named Merck Professor of Chemistry (2003) and Distinguished McKnight University Professor (2006). She joined the faculty of the Departments of Chemistry and Biochemistry at OSU as Ohio Eminent Scholar in 2007. Other previous awards include the Camille-Dreyfus Teacher Scholar Award, 1996-2001, the Pfizer Award in Enzyme Chemistry, 2002, and the Distinguished Women Scholars Award in Science and Engineering, 2004. 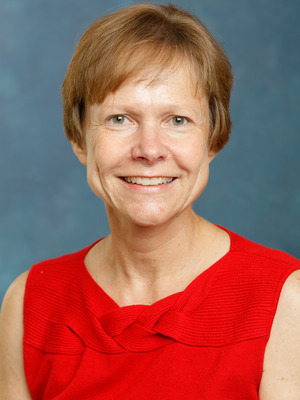 She has served as Director of the Chemical-Biology Interface Pre-doctoral Training Program (Minnesota, 2004-2006) and as co-chair of the Nucleic Acids Gordon Conference (2003). She currently serves on the Editorial Advisory Board for Accounts of Chemical Research (2006-2009) and on the NIH Molecular Genetics A study section panel (2006-2010). My group uses a wide variety of biochemical, molecular biology, and biophysical approaches to answer fundamental questions focusing on nucleicacids and proteins that are involved in translation of the genetic code andviral replication. Aminoacyl-tRNA Synthetases. Members of this ancient family of proteinscatalyze the esterification of an amino acid onto the 3'-end of tRNAs, which translate the genetic code through codon-anticodon recognition. Byvirtue of their specific recognition of tRNAs and their capability to discriminate among structurally similar amino acids, the aminoacyl-tRNAsynthetases play a central role in assuring a high degree of accuracy in protein synthesis. In comparison to our understanding of tRNA discrimination, relatively little is known about the mechanism synthetasesuse to discriminate amongst structurally related amino acids. To correct misactivation of noncognate substrates, many synthetases require editingactivity, and studies aimed at understanding the mechanism of translational editing are a major focus of research in this area. Recent studies ofprolyl-tRNA synthetase (ProRS) have uncovered a novel triple-sieve mechanism of editing mischarged Cys-tRNAPro that involves a smallfree-standing editing module known as YbaK. Ongoing studies are aimed at understanding the mechanism of editing by YbaK and mode of interaction withProRS.Nucleic Acid-Protein Interactions in HIV. During the life cycle of HIV, its RNA genome must be converted into DNA. This conversion is catalyzed byreverse transcriptase, an enzyme that uses a specific host cell tRNA Lysmolecule as a primer. The process by which HIV selects and uses a specific primer tRNA is not well understood, but we have recently shown that humanlysyl-tRNA synthetase (LysRS) is also packaged into HIV and appears to be a critical factor in specific tRNA packaging. Ongoing work is aimed atelucidating the molecular interactions between human LysRS and HIV proteins. In vivo, the tRNA primer and the HIV RNA genome must be unwound and annealed together before reverse transcription can be initiated. Theannealing process is mediated by the HIV nucleocapsid protein (NC), a nucleic acid "chaperone" protein that facilitates nucleic acidrearrangements. We have reconstituted in vitro systems that closely mimic several steps of the reverse transcription process in HIV to elucidate themechanism of NC's chaperone function. Unfolding of DNA Quadruplexes Induced by the HIV-1 Nucleocapsid Protein. Besik Kankia, George Barany, and Karin Musier-Forsyth (2005) Nucleic Acids Res. 33, 4395-4403. Single-Molecule FRET Studies of Important Intermediates in the Nucleocapsid Protein Chaperoned Minus-Strand Transfer Step in HIV-1 Reverse Transcription. Hsiao-Wei Liu, Gonzalo Cosa , Christy F. Landes, Yining Zeng, Daniel G. Mullen, Brandie J. Kovaleski, George Barany, Karin Musier-Forsyth, and Paul F. Barbara (2005) Biophys. J. 89, 3470-3479. Evidence for Non-Two-State Kinetics in the Nucleocapsid Protein Chaperoned Opening of DNA Hairpins. Cosa, G.; Zeng, Y.; Liu, H.W. ; Landes, C.F. ; Musier-Forsyth, K.; Barbara, P. (2006) J. Phys. Chem. B., 110(5), 2419. Evolutionary conservation of a functionally important backbone phosphate group critical for aminoacylation of histidine tRNAs. Abbey E. Rosen, Bonnie S. Brooks, Ethan Guth, Christopher S. Francklyn, and Karin Musier-Forsyth (2006)RNA,12 (7),1315-22. In vitro characterization of the interaction between HIV-1 Gag and human lysyl-tRNA synthetase. Brandie J. Kovaleski, Robert Kennedy, Minh K. Hong, Siddhartha A. Datta, Lawrence kleiman, Alan Rein, and Karin Musier-Forsyth (2006) J. Biol. Chem., 281 (28), 19449-56. Pre-transfer Editing by Class II Escherichia coli Prolyl-tRNA Synthetases: Role of Aminoacylation Active Site in “Selective Release” of Noncognate Amino Acids. Sanchita Hati, Brigitte Ziervogel, Julius SternJohn, Fai-Chu Wong, Maria C. Nagan, Abbey E. Rosen, Paul G. Siliciano, Joe Chihade and Karin Musier-Forsyth (2006) J. Biol. Chem., 281, 27862 - 27872. Mechanistic studies of mini-TAR RNA/DNA annealing in the absence and presence of HIV-1 nucleocapsid protein. My-Nuong Vo, George Barany, Ioulia Rouzina, and Karin Musier-Forsyth (2006) J. Mol. Biol., 363, 244-61. Rapid kinetics of protein-nucleic acid interaction is a major component of HIV-1 nucleocapsid protein's nucleic acid chaperone function. Margareta Cruceanu, Robert J. Gorelick, Karin Musier-Forsyth, Ioulia Rouzina, and Mark C. Williams (2006) J. Mol. Biol., 363(5), 867-77. Insights on the Role of Nucleic Acid/Protein Interactions in Chaperoned Nucleic Acid Rearrangements of HIV-1 Reverse Transcription. Hsiao-Wei Liu, Yining Zeng, Christy F. Landes, Yoen Joo Kim, Yongjin Zhu, Xiaojing Ma, My-Nuong Vo, Karin Musier-Forsyth, and Paul F. Barbara (2007) Proc. Natl. Acad. Sci. USA, 104, 5261-5267. Probing Nucleation, Reverse Annealing, and Chaperone Function along the Reaction Path of HIV-1 Single Strand Transfer. Yining Zeng, Hsiao-Wei Liu, Christy F. Landes, Yoen Joo Kim, Xiaojing Ma, Yongjin Zhu, Karin Musier-Forsyth, Paul F. Barbara (2007) Proc. Natl. Acad. Sci. USA, 104, 12651-12656. Single Molecule Study of the Inhibition of HIV-1 Transactivation Response Region DNA:DNA Annealing by Argininamide. Christy F. Landes, Yining Zeng, Hsiao-Wei Liu, Karin Musier-Forsyth, Paul F. Barbara (2007) J. Am Chem. Soc. 129(33), 10181-88. Deaminase-independent inhibition of HIV-1 reverse transcription by APOBEC3G. Yasumasa Iwatani, Denise S.B. Chan, F. Wang, Kristen Stewart Maynard, Wataru Sugiura, Angela Gronenborn, Ioulia Rouzina, Mark C. Williams, Karin Musier-Forsyth, and Judith G. Levin. (2007) Nucleic Acids Res. 35, 7096-7108. Critical Role of Helix 4 of HIV-1 Capsid C-terminal Domain in Interactions with Human Lysyl-tRNA Synthetase. Brandie J. Kovaleski, Robert Kennedy, Ahmad Khorchid, Lawrence Kleiman, Hiroshi Matsuo, and Karin Musier-Forsyth. (2007). J. Biol. Chem. 282, 32274 – 32279. The HIV-1 Central DNA Flap Region Contains a “Flapping” Third Strand. Besik I. Kankia and Karin Musier-Forsyth (2007) Biophysical Chemistry, 127, 64-68. Restoring species-specific posttransfer editing activity to a synthetase with a defunct editing domain. Julius SternJohn, Sanchita Hati, Paul G. Siliciano and Karin Musier-Forsyth (2007) Proc. Natl. Acad. Sci. USA, 104, 2127-2132. Inability of HIV-1 Produced in Murine Cells to Selectively Incorporate Primer tRNALys,3. Min Wei, Yilang Yang, Meijuan Niu, Laurie Desfosse, Robert Kennedy, Karin Musier-Forsyth, and Lawrence Kleiman (2008) J. Virol. 82, 12049-59. Functional Guanine-Arginine Interaction Between tRNAPro and Prolyl-tRNA Synthetase that Couples Binding and Catalysis. Brian Burke, Songon An and Karin Musier-Forsyth (2008) Biochemica Biophysica Acta - Proteins and Proteomics. Transfer RNA Modulates The Editing Mechanism Used By Class II Prolyl-tRNA Synthetase. Kathryn E. Splan, Michael Ignatov and Karin Musier-Forsyth (2008) J. Biol. Chem. 283, 7128-34. Evolution of Acceptor Stem tRNA Recognition by Class II Prolyl-tRNA Synthetase. Songon An, George Barany and Karin Musier-Forsyth (2008) Nucleic Acids Res. 36, 2514-2521. Fidelity of plus-strand priming requires the nucleic acid chaperone activity of HIV-1 nucleocapsid protein, Klara Post, Besik Kankia, Swathi Gopalakrishnan, Victoria Yang, Elizabeth Cramer, Pilar Saladores, Robert J. Gorelick, Jianhui Guo, Karin Musier-Forsyth, and Judith G. Levin, (2009) Nucleic Acids Res. 37, 1755-66. HIV-1 Nucleocapsid Protein Switches the Pathway of TAR RNA/DNA Annealing. My-Nuong Vo, George Barany, Ioulia Rouzina, and Karin Musier-Forsyth (2009) J. Mol. Biol. 386, 789-801. Effect of Mg2+ and Na+ on the Nucleic Acid Chaperone Activity of HIV-1 Nucleocapsid protein: Implications for Reverse Transcription. My-Nuong Vo, George Barany, Ioulia Rouzina, and Karin Musier-Forsyth (2009) J. Mol. Biol. 386, 773-788. Resampling and editing of mischarged tRNA prior to translation elongation. Jiqiang Ling, Byung-Ran So, Srujana S. Yadavalli, Herve Roy, Shinichiro Shoji, Kurt Fredrick, Karin Musier-Forsyth and Michael Ibba (2009) Molecular Cell 33, 654-660. Fluorescence Fluctuation Spectroscopy on Viral-Like Particles Reveals Variable Gag Stoichiometry. Yan Chen, Bin Wu, Karin Musier-Forsyth, Louis M. Mansky, and Joachim D. Mueller (2009), Biophys. J., 96, 1961-69. C-terminal domain regulates the nucleic acid chaperone activity of human T-cell leukemia virus type 1 (HTLV-1) nucleocapsid protein (NC) via an electrostatic mechanism. Dominic F. Qualley, Kristen M. Stewart-Maynard, Fei Wang, Mithun Mitra, Robert J. Gorelick, Ioulia Rouzina, Mark C. Williams and Karin Musier-Forsyth (2010) J. Biol. Chem. 285, 295-307.